For other uses, see Sita (disambiguation). Sita (pronounced [ˈsiː t̪aː] listen (help·info), Sanskrit: सीता, IAST: Sītā) or Seeta, is the consort of Lord Rama (incarnation of Vishnu and Krishna) and an avatar of Sri Lakshmi, the Hindu goddess that denotes good character, good fortune, prosperity, success, and happiness. She is esteemed as the paragon of spousal and feminine virtues for all women. Sita is the central female character and one of the central figures in the Hindu epic, the Ramayana. She is described as the daughter of the earth goddess, Bhūmi and the adopted daughter of King Janaka of Videha and his wife, Queen Sunaina. She has a younger sister, Urmila, and the female cousins Mandavi and Shrutakirti. Sita is known for her dedication, self-sacrifice, courage and purity. The goddess is best known by the name "Sita", derived from the Sanskrit word sīta, furrow. The Kausik-sutra and the Paraskara-sutra associate her repeatedly as the wife of Parjanya (a god associated with rains) and Indra. Sita is known by many epithets. She is called Jānaki as the daughter of Janaka and Maithili as the princess of Mithila. As the wife of Rama, she is called Ramā. Her father Janaka had earned the sobriquet Videha due to his ability to transcend body consciousness; Sita is therefore also known as Vaidehi. The birthplace of Sita is disputed. The Sita Kund pilgrimage site which is located in present-day Sitamarhi district,Bihar, India is viewed as the birthplace of Sita. Apart from Sitamarhi, Janakpur which is located in the present-day Province No. 2, Nepal, is also described as Sita's birthplace. Valmiki's Ramayana: In Valmiki's Ramayana and Kamban's Tamil epic Ramavataram, Sita is said to have been discovered in a furrow in a ploughed field, believed to be Sitamarhi in Mithila region of present-day Bihar, and for that reason is regarded as a daughter of Bhūmi Devi (the goddess earth). She was discovered, adopted and brought up by Janaka, king of Mithila and his wife Sunaina. Ramayana Manjari: In Ramayana Manjari (verses 344–366), North-western and Bengal recensions of Valmiki Ramayana, it has been described as on hearing a voice from the sky and then seeing Menaka, Janaka expresses his wish to obtain a child and when he finds the child, he hears the same voice again telling him the infant is his spiritual child, born of Menaka. Janka's real daughter: In Ramopkhyana of the Mahabharata and also in Paumachariya of Vimala Suri, Sita has been depicted as Janaka's real daughter. According to Rev. Fr. 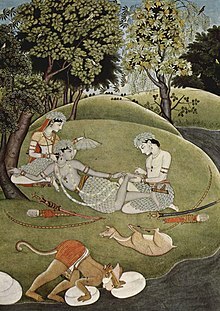 Camille Bulcke, this motif that Sita was the real daughter of Janaka, as described in Ramopkhyana Mahabharata was based on the authentic version of Valmiki Ramayana. Later the story of Sita miraculously appearing in a furrow was inserted in Valmiki Ramayana. Reincarnation of Vedavati: Some versions of the Ramayana suggest that Sita was a reincarnation of Vedavati. 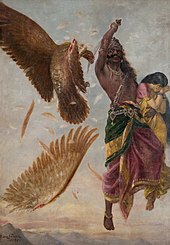 Ravana tried to molest Vedavati and her chastity was sullied beyond Ravana's redemption when she was performing penance to become consort of Vishnu. Vedavati immolated herself on a pyre to escape Ravana's lust, vowing to return in another age and be the cause of Ravana's destruction. She was duly reborn as Sita. Reincarnation of Manivati: According to Gunabhadra's Uttara Purana of the ninth century BCE, Ravana disturbs the asceticism of Manivati, daughter of Amitavega of Alkapuri and she pledges to take revenge on Ravana. Manivati is later reborn as the daughter of Ravana and Mandodari. But, astrologers predict ruin of Ravana because of this child. So, Ravana orders to kill the child. Manivati is placed in a casket and buried in the ground of Mithila where she is discovered by some of the farmers of the kingdom. Then Janka, king of that state adopts her. 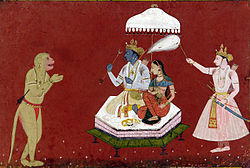 Ravana's daughter: In Sanghadasa's Jaina version of Ramayana and also in Adbhuta Ramayana, Sita, entitled Vasudevahindi, is born as daughter of Ravana. According to this version, astrologers predict that first child of Vidyadhara Maya (Ravana's wife) will destroy his lineage. Thus, Ravana abandons her and orders the infant to be buried in a distant land where she is later discovered and adopted by Janaka. Rama breaks the bow to win Sita as wife. When Sita reaches adulthood, Janaka organizes a Swayamvara in Janakpurdham with the condition that Sita would marry only that person who would be able to string Pinaka, the bow of the god Shiva. Janaka knew that the bow of Shiva was not even liftable, let alone stringable for ordinary mortals, and for selfish people it was not even approachable. Thus, Janaka tries to find the best husband for Sita. At this time, Vishvamitra had brought Rama and his brother Lakshmana to the forest for the protection of sacrifice. Hearing about this swayamvara, Vishvamitra asks Rama to participate in it and takes Rama and Lakshmana to the palace of Janaka in Janakpur. Janaka is greatly pleased to learn that Rama and Lakshmana are sons of Dasharatha. Next morning, in the middle of the hall, Rama lifts up the bow of Shiva with his left hand, fastens the string tightly and finally breaks the bow. However, another avatar of Vishnu, Parashurama, became really angry as the bow of Shiva was broken. However, he does not realize that Rama is also an avatar of Vishnu, therefore after being informed of this, he apologizes for getting angry. Thus, Rama fulfills Janaka's condition to marry Sita. Later on Vivaha Panchami, a marriage ceremony is conducted under the guidance of Satananda. Rama marries Sita, Bharata marries Mandavi, Lakshmana marries Urmila and Shatrughna marries Shrutakirti. Some time after the wedding, Kaikeyi, Rama's stepmother, compelled Dasharatha to make Bharata king, prompted by the coaxing of her maid Manthara, and forced Rama to leave Ayodhya and spend a period of exile in the forests of Dandaka and later Panchavati. Sita and Lakshmana willingly renounced the comforts of the palace and joined Rama in exile. The Panchavati forest became the scene for Sita's abduction by Ravana, King of Lanka. Ravana kidnapped Sita, disguising himself as a mendicant, while Rama was away fetching a golden deer to please her. Some versions of the Ramayana describe Sita taking refuge with the fire-god Agni, while Maya Sita, her illusionary double, is kidnapped by the demon-king. Jatayu, the vulture-king, tried to protect Sita but Ravana chopped off his wings. Jatayu survived long enough to inform Rama of what had happened. Ravana took her back to his kingdom in Lanka and Sita was held as a prisoner in one of his palaces. During her captivity for a year in Lanka, Ravana expressed his desire for her; however, Sita refused his advances and struggled to maintain her chastity. Hanuman was sent by Rama to seek Sita and eventually succeeded in discovering Sita's whereabouts. Sita gave Hanuman her jewellery and asked him to give it to her husband. Hanuman returned across the sea to Rama. Sita was finally rescued by Rama, who waged a war to defeat Ravana. Upon rescue, Rama makes Sita undergo a trial by fire to prove her chastity. In some versions of Ramayana, during this test the fire-god Agni appears in front of Rama and attests to Sita's purity, or hands over to him the real Sita and declares it was Maya Sita who was abducted by Ravana. The Thai version of the Ramayana, however, tells of Sita walking on the fire, of her own accord, to feel clean, as opposed to jumping in it. She is not burnt, and the coals turn to lotuses. The couple came back to Ayodhya, where Rama was crowned king with Sita by his side. While Rama's trust and affection for Sita never wavered, it soon became evident that some people in Ayodhya could not accept Sita's long captivity under Ravana. During Rama's period of rule, an intemperate washerman, while berating his wayward wife, declared that he was "no pusillanimous Rama who would take his wife back after she had lived in the house of another man". This statement was reported back to Rama, who knew that the accusation against Sita was baseless. Nevertheless, he would not let slander undermine his rule, so he sent Sita away. Thus Sita was forced into exile a second time. Sita, who was pregnant, was given refuge in the hermitage of Valmiki, where she delivered twin sons named Kusha and Lava. In the hermitage, Sita raised her sons alone, as a single mother. They grew up to be valiant and intelligent and were eventually united with their father. Once she had witnessed the acceptance of her children by Rama, Sita sought final refuge in the arms of her mother Bhūmi. Hearing her plea for release from an unjust world and from a life that had rarely been happy, the Earth dramatically split open; Bhūmi appeared and took Sita away. 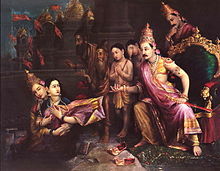 Sita's exile during her pregnancy was because of a curse during her childhood. According to Padma-puran, Sita had caught a pair of birds when she was young. The birds were talking about story of Sri Ram heard in Valmiki ashram which intrigued Sita. (She has the ability to talk with animals.) The female bird was pregnant at that time. She requested Sita to let her go but Sita only allowed her male companion to fly away. As a result, the bird cursed Sita that she would suffer a similar fate of being separated from her husband during pregnancy. The male bird was reborn as washerman. While the Ramayana mostly concentrates on Rama's actions, Sita also speaks many times during the exile. The first time is in the town of Chitrakuta where she narrates an ancient story to Rama, whereby Rama promises to Sita that he will never kill anybody without provocation. The second time Sita is shown talking prominently is when she speaks to Ravana. Ravana has come to her in the form of a mendicant and Sita tells him that he does not look like one. Sita is said to be the daughter of Ravana's queen Mandodari. It was predicted that the first child of Mandodari would bring annihilation to the family. Hence, Ravana deserted the child when she was born. The minister who was responsible for this took her in a pearl-box, placed her near a plough and told King Janaka of Mithila that the girl had been born from the furrow. Janaka's queen Sunaina became Sita's foster mother. There is also a narration about Sita's brother Bhamandala. He did not know that Sita was his sister and wanted to marry her. He even wanted to abduct her. This story ends when Bhamandala, after learning that Sita is his sister, becomes a Jain ascetic. 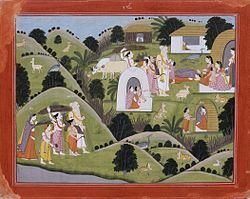 A female deity of agricultural fertility by the name Sita was known before Valmiki's Ramayana, but was overshadowed by better-known goddesses associated with fertility. According to Ramayana, Sita was discovered in a furrow when Janaka was ploughing. Since Janaka was a king, it is likely that ploughing was part of a royal ritual to ensure fertility of the land. Sita is considered to be a child of Mother Earth, produced by union between the king and the land. Sita is a personification of Earth's fertility, abundance and well-being. Swami Vivekananda states that Rama is considered the type of the Absolute and Sita that of Power. Sita is the ideal of a woman in India and worshiped as God incarnate. According to Swami Vivekananda, Sita is typical of India – the idealized India. Swami Vivekananda assured that if world literature of the past and world literature of the future were thoroughly exhausted, yet, it would not be possible to find another Sita, because Sita is unique; the character was depicted once for all. Swami Vivekananda felt there may have been several Ramas, perhaps, but never more than one Sita. "All our mythology may vanish, even our Vedas may depart and our Sanskrit language may vanish for ever, but so long as there will be five Hindus living here, even if only seeking the most vulgar patois, there will be the story of Sita present." Hindu tradition reveres Sita. She has been portrayed as an ideal daughter, an ideal wife and an ideal mother in various texts, stories, illustrations, movies and modern media. Sita is often worshipped with Rama as his consort. The occasion of her marriage to Rama is celebrated as Vivaha Panchami. The actions, reactions and instincts manifested by Sita at every juncture in a long and arduous life are deemed exemplary. Her story has been portrayed in the book Sitayanam. The values that she enshrined and adhered to at every point in the course of a demanding life are the values of womanly virtue held sacred by countless generations of Nepalese and Indians. Her portrayal as an ideal queen is ambiguous. Her sacrifices and actions are most often portrayed in her personal capacity and not as a governance figure. Sita was abducted because she had to step out of the safety line to give alms to Ravana disguised as a Brahmin. The giving of alms to Brahmin in those times was more of a duty to be performed, rather than an optional charitable act. This held true more so for the royals and they were to lead by example. Also, the incident of Sita's refusal to come back with Hanuman like a common thief, her renunciation of queenhood and exile from Ayodhya after her return. All her key aspects are shown in a favourable light, not as a head of state, but as an ideal woman. In contrast, Sri Rama is always portrayed as a fair and just king who gave highest priority to the good of his people, in addition to being depicted as an ideal husband and an ideal son. ^ a b "Hot spring hot spot - Fair begins on Magh full moon's day". www.telegraphindia.com. Retrieved 22 December 2018. ^ a b "Sitamarhi". Britannica. Retrieved 30 January 2015. ^ a b "History of Sitamarhi". Official site of Sitamarhi district. Archived from the original on 20 December 2014. Retrieved 30 January 2015. ^ a b "Narendra Modi Cancells his visit to Sita's birthplace Janakpur, Nepal". ^ a b "Birthplace of Sita in Janakpur, Asia Travels". ^ "Srimad Bhagavatam Canto 9 Chapter 10 Verse 2". Bhaktivedanta Vedabase A Treasure of Spiritual Knowledge. ^ "Sita, Hindu Deity and incarnation of Lakshmi". Michigan State University. Retrieved 1 August 2012. ^ Sutherland, Sally J. "Sita and Draupadi, Aggressive Behavior and Female Role-Models in the Sanskrit Epics" (PDF). University of California, Berkeley. Retrieved 1 August 2012. ^ a b c Swami Parmeshwaranand (1 January 2001). Encyclopaedic Dictionaries of Puranas. Sarup & Sons. pp. 1210–1220. ISBN 978-81-7625-226-3. Retrieved 31 July 2012. ^ a b Suresh Chandra (1998). Encyclopaedia of Hindu Gods and Goddesses. Sarup & Sons. pp. 304–. ISBN 978-81-7625-039-9. Retrieved 1 August 2012. ^ a b Heidi Rika Maria Pauwels (2007). Indian Literature and Popular Cinema: Recasting Classics. Routledge. pp. 53–. ISBN 978-0-415-44741-6. Retrieved 31 July 2012. ^ "Bihar times". Archived from the original on 19 October 2014. ^ "The Story of Mother Sita the consort of Rama". Salagram.net. Archived from the original on 30 May 2012. Retrieved 18 March 2012. ^ a b c d e Singaravelu, S (1982). "Sītā's Birth and Parentage in the Rāma Story". Asian Folklore Studies. University of Malaya, Kuala Lumpur, Malaysia. 41 (2): 235–240. doi:10.2307/1178126. JSTOR 1178126. ^ a b c Mani pp. 720-3; Mani, Vettam (1975). Puranic Encyclopaedia: a Comprehensive Dictionary with Special Reference to the Epic and Puranic Literature. Motilal Banarsidass Publishers. ISBN 978-0-8426-0822-0. ^ Bhargava, Anju P. "Contemporary Influence of Sita by". The Infinity Foundation. Archived from the original on 13 July 2012. Retrieved 31 July 2012. ^ "Padma-puran pdf file" (PDF). 1 October 2018. Retrieved 1 October 2018. ^ Valmiki, Ramayana. "Sundarkanda, sarga 37". www.valmiki.iitk.ac.in. IIT Kanpur. Jain, Pannalal (2000). Hiralal Jain, A.N. Upadhaye (ed.). Ravishenacharya's Padmapurana (in Hindi) (8th ed.). New Delhi: Bhartiya Jnanpith. ISBN 978-81-263-0508-7. Das, Sisir Kumar (2005). A History of Indian Literature, 500-1399: From the Courtly to the Popular. Sahitya Akademi. p. 124. ISBN 978-81-260-2171-0. "Sītā" . New International Encyclopedia. 1905.